Yesterday we left off with Oscar finding Reeva in the toilet room. He continues on from there. Oscar knelt down over Reeva. She was slumped on the toilet bowl. He checked to see if she was breathing and she was not. He put his arms under her shoulders and pulled her weight on to him. He sat there crying for some time. Her head was on his left shoulder and he could feel the blood running down on him. At some point he heard her breathing. Oscar sat down on the ground, with his back against the wall and Reeva was still on top of him. He could see that her arm was broken. He then said he was “on his knees and one of his feet” and was pulling her in to the bathroom. He pulled one of the bathroom carpets closer and laid her down softly on the carpet. The courtroom is absolutely silent. Oscar talks slowly and pauses often. You could hear a pin drop in that room. Everybody is listening very intently and clearly heavy with emotion. He saw that her cell phone was in the toilet room. So her phone was locked in the toilet room with her. He grabbed the phone and tried to make a call but it was pass code protected and he couldn’t access it. He ran back to the bedroom where his phone was on the left hand side of the bed. 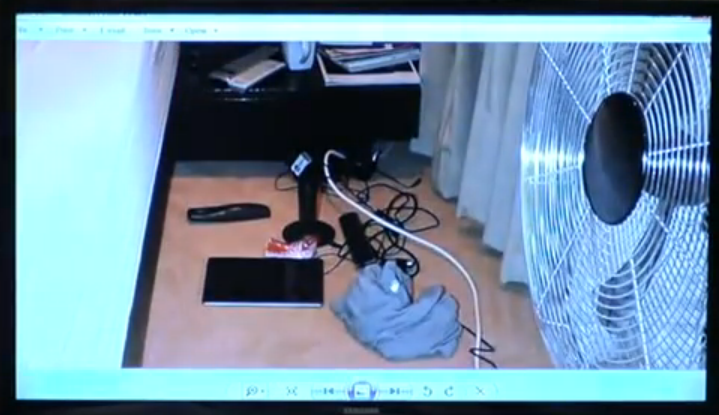 Both his phones were there, he picked them up and ran back to Reeva. He then phoned Johan Stander who was a gentleman who lived in the estates. Somebody that Oscar had become a friend with. He asked him to come and help. He was struggling to pick Reeva up and he needed help. This call was at 3:19:03. He continues that he was trying to pick her up and couldn’t. He starts to explain that he took her arm and placed it across her body and Roux cuts him off there. He wants to address the other calls that Oscar made first. At 3:20:05 he phoned 911 (Netcare). He doesn’t remember speaking to the operator but he does remember he (the operator) telling him that he needed to get Reeva to the hospital, that he must not wait for them. At 3:21:33 Oscar phoned security (Baba). The call lasted 9 seconds. Oscar does not remember this. He next says that after he got off the phone with Netcare, he ran downstairs to open the door. But we can’t forget that security (Baba) called Oscar back at 3:22 and they spoke. Did he speak to him while he was in the process of running down the stairs? Oscar conveniently left this out. This is when Oscar told Baba that “everything is fine”. It seems interesting to me that he can remember speaking to Johan Stander two minutes before, but he doesn’t recall this at all. He says again that he could barely pick Reeva up so he would not be able to carry her and open the doors. I want to stop here because I’m having a hard time understanding how this man is not capable of picking up a woman who probably weighs about 110 lbs. According to him, his prosthetics were on at this point, so he has use of his legs. He first opened his bedroom door then he went and opened the front door. He ran back up to his room. On the way in to his room he tried to force open the door. He explains to the Judge that the door to his bedroom is a double door. The main door locks with a key and the other door has a latch at the top and bottom. He “ran in to the door and it didn’t break open.” So he reached down and unlatched the latch and it opened. 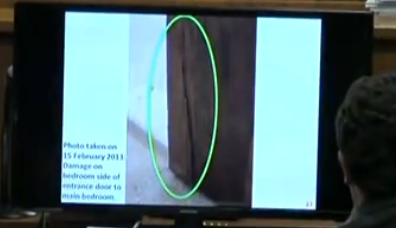 Here is how the door was found by crime scene investigators. He goes on to explain that he got the house to be wheelchair friendly. If you want to have a wider passage on the doors you have to open both doors. He went back to the bathroom, he picked up Reeva. He doesn’t recall carrying her some of the way but he remembers arriving at the second flight of stairs. Mr. Stander and his daughter (Clarice) had arrived. Oscar was shouting for them to help him get her to the hospital. When he reached the bottom of the stairs, one of the Standers told him to put her down and that an ambulance was on the way. Oscar kept saying we need to get her to the hospital and they said just put her down, the ambulance is on its way. He sat there with her and waited for the ambulance to arrive. He felt helpless. He wanted to take her to the hospital. He had his fingers in her mouth to try to help her breath and his hand on her hip to try to stop the bleeding. Roux asks him who was with him at the time. Oscar says that the Standers were there with him at that time. Roux also wants him to explain the presence of plastic bags at the scene. Oscar says he needed something to put pressure on the hip. A plastic bag seems like a very odd thing to use when trying to stop bleeding. He also states that Clarice asked him for tape or rope so that she could help stop the bleeding on the arm wound. Oscar can’t remember if he or Clarice went to fetch those items from the utility closet. Roux asks him if he did anything with the bags and Oscar says he can’t remember. Again, selective memory. Plastic bags, rope and tape are very suspicious items to be found at a murder scene and Oscar doesn’t want to be pegged as the person who grabbed or used these items. It sure as heck makes me wonder what he was really going to do with these items. He says that Dr. Stipp tried to help Reeva but he didn’t seem like he knew what he was doing. He seemed overwhelmed by the situation. Everything that Dr. Stipp told him to do, he was already doing. He was already trying to help Reeva breath. So is he somewhat blaming Dr. Stipp for Reeva not surviving? Why would he imply that the doctor didn’t know what he was doing? It certainly seems like he’s pointing the finger at everybody else for not getting her help. Netcare told him to drive her in, the Standers told him to put her on the floor, Dr. Stipp didn’t know what he was doing. Wow. He shot her, but it’s everybody else’s fault that she didn’t get help. To me, this is very telling on how his mind works. Oscar goes on to say that Dr. Stipp was kneeling down on her right hand side for a few minutes and then he walked outside. Oscar says he was shouting for him to come back in the house and help him. Dr. Stipp, nor Baba, testified that Oscar was shouting for the doctor to come back inside. He went and stood a few meters away where the kitchen and dining room meet. The lady paramedic went to him and she informed him that Reeva had passed. The paramedic asked him for some identification for her. He went up to his bedroom to get her handbag. He says he didn’t go through it. He simply took the bag and brought it out. Clarice was waiting there outside his bedroom and he gave the handbag to her. He then went back downstairs to where the paramedics were and he sat on the kitchen floor near the island, crying. The police offers arrived shortly after. They were dressed in civilian clothing. Colonial Van Rensburg arrived at the same time. Oscar was unable to speak with him. One of the officers asked him to just stay in the kitchen. An officer was at the bottom of the stairs. They asked him if there was anybody else in the house. He motioned that there wasn’t. He checked the downstairs and upstairs of the home. Oscar was still sitting on his kitchen floor. Every time he would look up there were more policeman and more people inside, going up and down the stairs. He is now standing on the far side of the kitchen. He asked the policeman if he could wash his hands because the smell of the blood was making him throw up. The policeman said he’d ask Col. Van Rensburg and Col. Van Rensburg came over to him and said he may wash his hands. He doesn’t remember washing his chest, he just remembers washing his hands and his face. 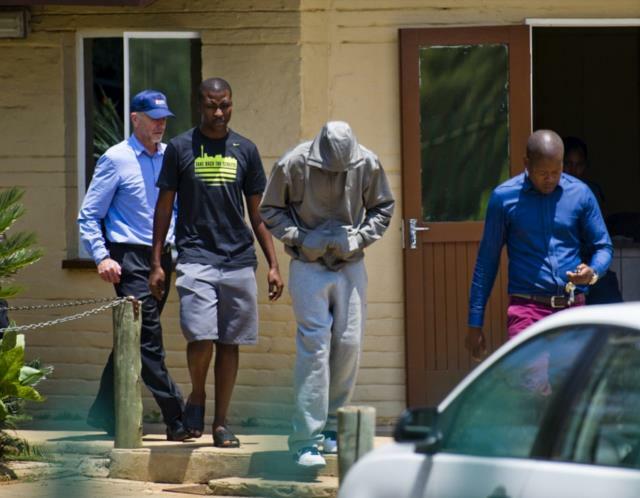 He was still standing in the kitchen when Hilton Botha arrived. Botha asked Oscar if he remembered him. Botha immediately went from the kitchen to the upstairs and then came down sometime later. Oscar says he could not look outside the kitchen because every time he saw Reeva he got sick so he stayed far inside the kitchen and also went in to the pantry and sat against the washing machine. I’m curious why he mentions that. Perhaps he was out of sight for some time, maybe making calls or doing something else, and he needs to explain where he was. Just my speculation. It seemed like he was over-explaining. Oscar says Hilton Botha went back upstairs a second time. And Van Rensburg came over to Oscar and put his hand on his shoulder and said that he didn’t need to speak to anybody but that he needed him to go to the garage; they’d like to take some photos and a police photographer would be there. The same officer that had been at the bottom of the stairs took Oscar to the garage, along with Van Rensburg. That same officer stayed in the garage with Oscar the whole time. He was in there for several hours. He asked the photographer if he could just please take all the photos he needed so he could take his bloody clothes off. From the garage he was taken to the foyer area of his home and a police officer introduced himself, Gerard Labuschagne, and told Oscar that he was a family member of his and that he didn’t have anything to worry about. He was there to look after him. Col. Van Rensburg then informed him that since he was the only person in the house they were going to charge him. They placed him under arrest and walked him to a waiting car in the driveway, along with two other officers. One officer sat next to him in the back of the car, one officer drove and the officer that was identified as the family member, Labuschagne, sat in the passenger side of the car. Oscar was advised that there was a lot of media outside and he should put his head down and to also do the same if any media in cars drove by them. He was taken to a hospital and brought inside the reception area. The doctor introduced himself and he conducted various tests, took samples, etc. Roux asks Oscar about his call to Justin Devaris around 3:55am that morning. Oscar states that Clarice asked him if she should phone anyone. She called Justin but Oscar doesn’t remember if he spoke to him or not. Clarice also contacted his agent (Pete Van Zyl) who he is very close with. She also phoned his brother Carl. Oscar did not phone any lawyer. Roux has asked Mangena to bring the cricket bat with him today. They are going to do some demonstrations on the door. First, Roux wants to know what Oscar thinks about Vermeulen asserting that Oscar was on his stumps when he hit the door. Oscar states he can barely stand on his stumps let alone wield a bat on them. He says he was wearing his prosthetic legs. Roux brings up that the Stipps and others heard what they thought were gunshots around 3:17pm. He wants to know from Oscar what those noises were. Oscar says they were the cricket bat hitting the door. Just before hitting the door with the bat, he had previously walked through the bathroom and kicked the door. This is the time that Dr. Stipp saw a figure in the window moving from right to left. Oscar says that was him going to kick the door. Roux then mentions that Dr. and Mrs. Stipp heard loud bangs earlier as well. He wants to know from Oscar what those sounds were. Oscar says those were the gunshots. Roux asks Oscar approximately how long it was in between the gunshots and the cricket bat hitting the door. Oscar says he’s mapped this out and he estimates that it was 5 minutes. Roux points out this is consistent with Mr. Johnson’s notes that the female screaming was occurring around 3:12pm and the second bangs were around 3:17pm. Roux then challenges Dr. Stipp’s testimony that there was a very brief amount of time in between bangs and Oscar says this is not physically possible. They then do some demonstrations. Roux has Oscar show how high he can kick. They point out that it’s the height of the door handle. Oscar then mimics how he hit the door with the bat but he first tells the Judge that it’s very difficult for him to show in a passive way right now how he did it. That night he was trying to break the door in so he hit it with all his might. He held the bat with both hands behind his head and swung down in what I imagine would be like a chopping motion (although this was off camera and we could not see it.) He does not remember where he was standing in proximity to the door. He doubts he remained in one position. He had socks on his legs at the time so the floor was slippery. They move on to some of the neighbors and Roux tells Oscar that they will deal with the witness statements that the State chose not to use. Oscar states he has a neighbor that he knows as “Kenny” on the right hand side (if you are looking at his house from the front.) It’s house # 285 on the photo with the orange roof. Kenny’s statement to police makes reference to crying and not a woman screaming. Both he and Oscar moved in to the estates in 2005. Oscar gave him a welcoming gift. Many times when Oscar drives by he will greet them if they’re outside. Oscar has never been inside Kenny’s home and vice versa. Oscar does not know his wife. 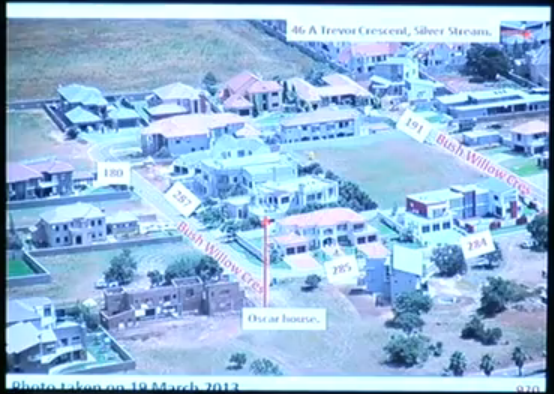 The neighbor on the left hand side (if you are looking at Oscar’s house from the front) is Mr. Nhlengthwa (Mike). He is house # 287 on the photo. Oscar knows him. They had the same developer that built their homes. They both shared a passion for cars. They would often chat outside. He was a good neighbor to Oscar. He doesn’t know him on a social level but they did chat often. Oscar also knows his wife but not as well as he knows Mike. Mike has never been in Oscar’s home. Oscar has been in his home once when it was first being built. Mike’s statement to police was also that he heard crying but not a woman screaming. Oscar’s bathroom window is on the back of his house and Mike’s bedroom is on the back of his house. They are on the same side, but I don’t believe they are facing each other. Roux says that the wife’s statement is that she woke up to a bang, Mike got up, and at 3:16 he made a call to security, prior to the second bangs. She heard loud crying and not a woman screaming. Roux asks Oscar if he knows the domestic worker who works for the Stipps. He does not know her but is aware that her statement was that she did not hear a woman screaming. 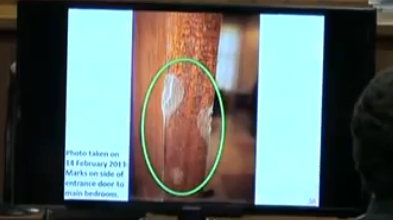 Roux wants to talk about the figure that was seen by Dr. Stipp walking in the window. Oscar says that if he didn’t have his legs on, they would likely have only seen his head or possibly his shoulders at most from the outside. They would not have seen his torso. Oscar contends that Dr. Stipp must have seen him when he went in to the bathroom to kick the door with his prosthetic leg. 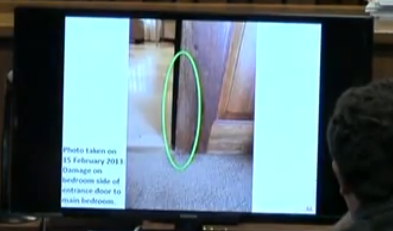 Oscar reiterates that he shot with his legs off and broke the door down with his legs on. Roux confers with Oldwage and they have no further questions. Nel: You were and you still are one of the most recognized faces all over the world, do you agree? 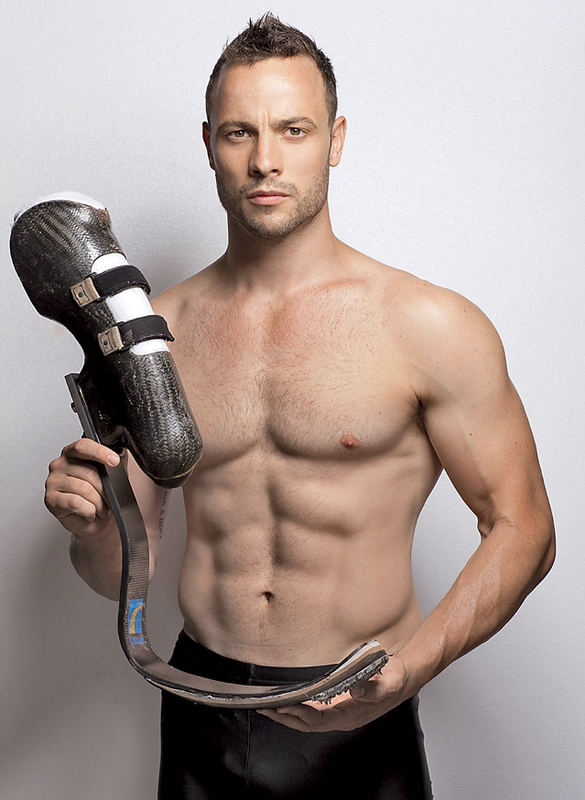 Nel: You are a model for sportsmen, disabled and able-bodied sportsmen all over the world. Oscar: I think I was, My Lady, I made a terrible mistake. Nel: You made a mistake? Nel: You killed a person, that’s what you did, didn’t you? Oscar: I made a mistake. Nel: You killed Reeva Steenkamp, that’s what you did. Oscar: I made a mistake, My Lady. Nel: You’re repeating that three times. What was your mistake? Oscar: My mistake was that I took Reeva’s life. Nel: You killed her. You shot her and killed her. Won’t you take responsibility for that? Oscar: I did, My Lady. Nel: Then say it then. Say yes, I shot and killed Reeva Steenkamp. Nel goes on to say that Oscar is known as a sports hero and people look up to him, isn’t that correct. Oscar says he doesn’t check the media anymore. He is aware that people’s opinions of him have changed. But he acknowledges that yes in the past people did look up to him. Nel tells him he has a responsibility to the people to tell the truth. Oscar says that he has a responsibility for both he and for Reeva to tell the truth. Oscar says he is there to tell the truth, as much as he can remember, from that night. Nel asks him if he is going to hide things from the court. He says he won’t. Nel then asks him what is a zombie stopper? Oscar cannot recall. Nel wants to know if he’s ever seen a video of himself in the presence of other people referring to a zombie stopper. Oscar can’t recall, but he says if you can show me that video he can confirm. Nel says he’ll gladly show him. Roux objects. Both he and Nel engage in a legal back and forth with the Judge over whether or not this video is admissible. The Judge adjourns, the video is reviewed, and ultimately she allows it in. Here it is in full. They only showed the shooting portion in court. They show the video and Nel asks Oscar if he now recalls. Oscar states he has seen this video before but didn’t recall the words zombie stopper. He says he was at Mr Rens’ shooting range (the man who testified about his gun training) and he was shooting at a watermelon with a handgun. It wasn’t him laughing in the background but it was him speaking. Nel asks him what kind of ammunition he was using. The first part was a shotgun and the second part was .50 caliber handgun. Did it have black talon ammunition? He says no, it was different ammunition, far bigger caliber. Nel states you can see the effect it had on the watermelon, it exploded. He goes on to say that the same happened to Reeva’s head. He puts up a picture the deceased Reeva and tells Oscar to take a look at it. Take responsibility and look at it. Oscar says he has taken responsibility by waiting for his time on the stand to tell his story for the respect of Reeva and for himself. He has taken responsibility, but he will not be forced to look at this picture. He is extremely emotional and crying as he speaks. 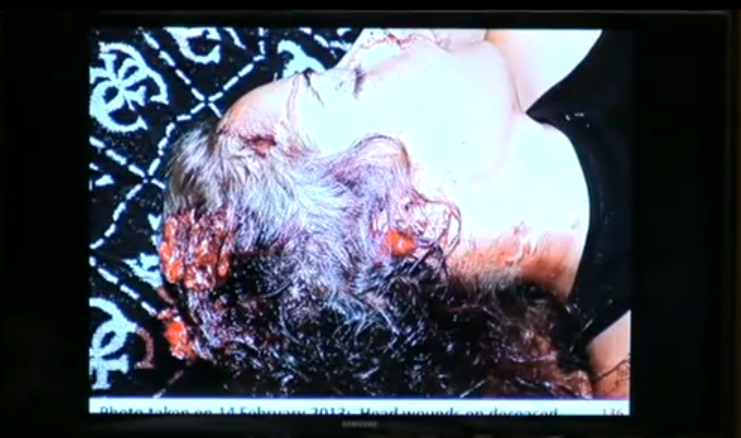 Nel is pushing him on the comparison of shooting a watermelon to Reeva’s head, Roux stand up and strongly objects. 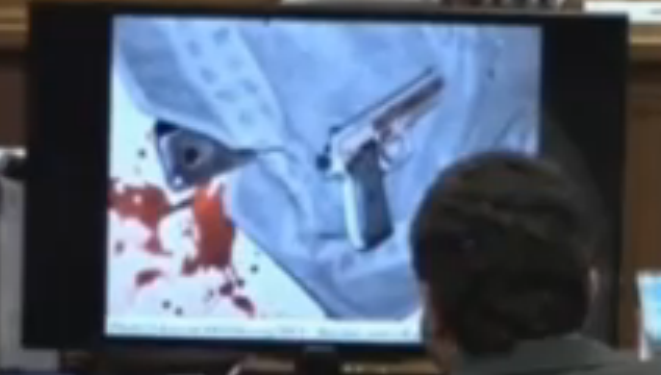 He feels it’s an unfair comparison, the Judge agrees and asks Nel to remove the image from the screen. Nel asks Oscar if he can carry on. Oscar is weeping and not answering. Nel states that he can see Oscar is visibly upset and asks for an adjournment. They come back and Nel is again talking about the shooting range. Nel wants to know what the purpose was of them making that video. Oscar says they were using the .50 caliber ammunition because it’s not typically used in guns. He then goes on to say that Mr. Nel has been at the same range shooting the same gun so he should know it’s not black talon ammunition. He had to get that little dig in there. Oscar states it was just simply a group of friends shooting at the range, it was not an exercise. Nel puts to him that he wanted to see the effects of the gun on the watermelon and Oscar agrees, they did. Oscar goes on to say that he used to enjoy shooting at the range. They would shoot at various different targets. He admits that the day they shot the watermelon, the comment he made was distasteful but it was made in reference to a zombie, not a human being. They move on now. Nel wants to know if the testimony that he has given the last few days, it his memory or is it a reconstruction? Oscar says there were many topics discussed. He says he has been telling the truth. Obviously some of it is a reconstruction because he wouldn’t know about phone calls made by other people so he has had to rely on records in evidence that were furnished to him. It’s a mix of what he remembers and other points are a reconstruction based on the statements of the 100+ people that the State has spoken to. So Nel now wants to test what he can remember and what was reconstructed. Nel asks from the time he fell asleep on February 13, to the time that he shot Reeva on the 14th, is there any reconstruction. Oscar says no. He admits there are some things he doesn’t remember from that night like speaking with Mr. Baba, switching on the lights in the bathroom, parts of him carrying Reeva downstairs. Nel wants to know again… did he take in to account any other evidence to form his version of events that he is giving in court for the time from when he went to sleep to the time that he killed Reeva. Oscars tells the Judge that he feels it’s important to state that his version has never changed. He gave his version for the bail affidavit before he knew any of the evidence that would be compiled against him. He tendered his story to his counsel and they compiled the bail transcript. Oscar gets defensive and he points out that there are aspects of his story that he shared with his counsel that they didn’t include in the bail statement. He also points out that the State’s case has changed many times, but he has not changed his version. Nel wants to know why Oscar is arguing, not answering, the questions. Roux jumps in to help Oscar and tells the Judge that he thinks it would be helpful for Mr. Nel to pare down his questions, be more specific about wanting to know what is memory and what is reconstruction. Nel believes he is doing that and the Judge basically tells Nel that Oscar has answered and said sorry, so they move on. 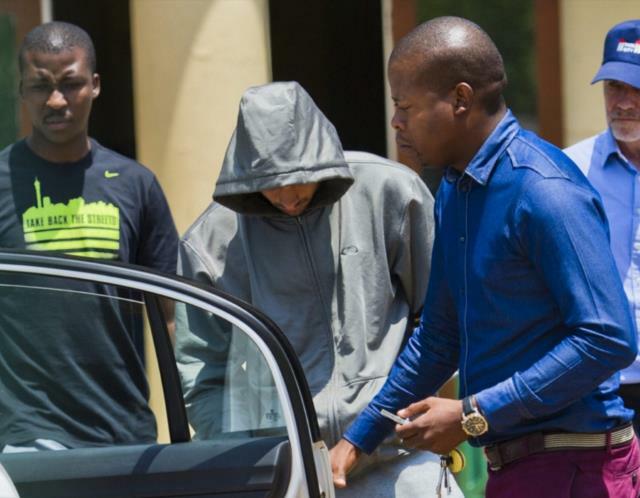 Nel asks Oscar to list the items that he told his counsel that they did not include in his initial bail statement. He states he can’t remember all of them but recalls it was Reeva speaking to him as he sat up in bed and phoning security (Baba). His understanding of the bail hearing was that he did not have to give that statement but he did so anyway. Nel asks him if there was anything in his bail affidavit that wasn’t true. And he states no, he told the truth. Nel wants to know if Oscar put the fans on the balcony or only one leg of the fan on the balcony. Oscar explains that he only put one leg of the standing fan on the balcony and the other two legs were inside. The small plastic fan was also on the carpet. Nel asks to retrieve them, did he ever have to go outside and he says no, he didn’t have to go out on the balcony? This is huge. His story rides on Reeva getting up out of bed and him not seeing her. He originally claimed he was out on the balcony when this happened, that’s why he didn’t see her. Oscar states he was standing by the amplifier when he heard the noise in the bathroom, the window opening. So Nel wants to know if somebody made the statement that he went out on the balcony to retrieve the fans, would that be untrue? And Oscar agrees it would be. He did not go out on the balcony. 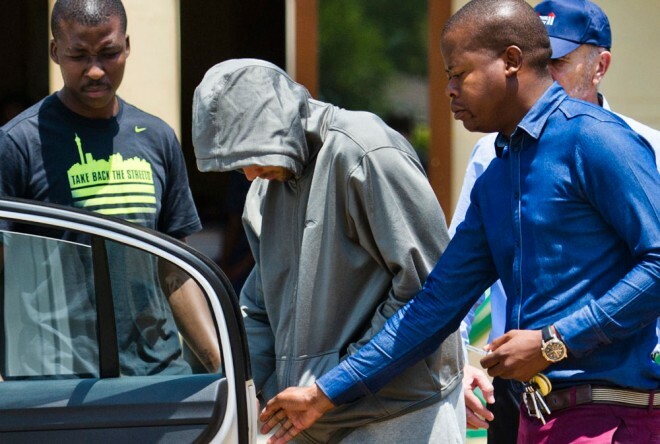 Nel was able to establish that portion of his bail affidavit was false. As to the reference to only one fan in the bail affidavit and the two fans in the plea statement, Oscar explains that by saying only one of the fans had a leg out on the balcony. The other one was on the carpet inside. Nel now wants to know if it’s still Oscar’s contention that the scene was tampered with by police (as stated in his plea statement). Oscar says yes it is. Nel wants to know where there was tampering. Oscar says he has been advised by his counsel that they will have witnesses coming to testify about this. He has seen many photos where there are massive inconsistencies and things have been moved. Nel would not accept this. He wants a specific answer from Oscar as he is asserting this in his plea. Oscar said they can go through the photo files and he can point them out. Nel wants to know from him, what was the one thing that was changed that bothered him the most. Oscar states that anything that gets tampered with is bothersome. 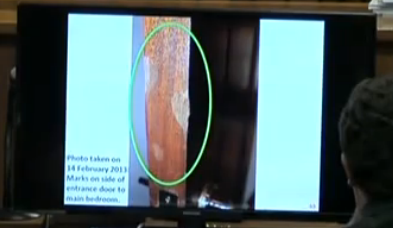 Oscar points out that the cell phones in the bathroom were moved, the firearm was moved, the cricket bat had moved in the bathroom, the discs and the fans in his room were moved, the curtains were moved. Nel stops him and wants to slow down, take them one at a time. They first talk about Reeva’s cell phone in the bathroom. Nel wants to know where it was prior to it being moved. Oscar talks about the differing positions that the phone was in when he reviewed the photos, but that doesn’t answer Nel’s question. He wants to know where the phone was. Remember, Oscar testified that he had picked the phone up from the toilet room and tried to use it to make a call. So he put it down somewhere in the bathroom. Oscar doesn’t remember where he put it. So Nel wants to know how it was tampered with if he can’t remember where it was. Oscar says he’s not saying the State tampered with it (although he actually is, that was in his plea that there was tampering) he’s just simply saying it was moved as evidenced by different photos. He also goes on to say that people were walking around his house without protective coverings, that’s what he considers contamination. Nel moves on to the fans. He wants to know how they were tampered with. Oscar states to the court that the assertions of tampering and contamination will be dealt with through his counsel using their investigation and experts. He doesn’t believe that he should have to document everything that they believe is an issue. Nel still wants to discuss the fans. Oscar says he remembers the fans were running that night; it was an extremely warm evening. According to some of the officers, they say the fans were off, so he would say they were tampered with. Also, in one of the photos that didn’t include a date or time stamp that was viewed in court, they saw one of the officers unplugging a fan to plug in their cell phone. This was a photo taken by police, so he believes this was tampering. Oscar still doesn’t really want to get in to many details on the tampering, he wants his counsel to deal with it through the experts, and Nel wants to know which experts are coming to testify. He wants names. Nel brings up that Oscar just said they reworked their evidence. Oscar says he corrected himself and said they worked with him on it. It was a mistake that he used that word. Nel says that’s interesting. They next look at photos of the bedroom. The first photo shown is from Album 1, the album that shows the scene as it was initially found. These are the photos taken by Van Staden. 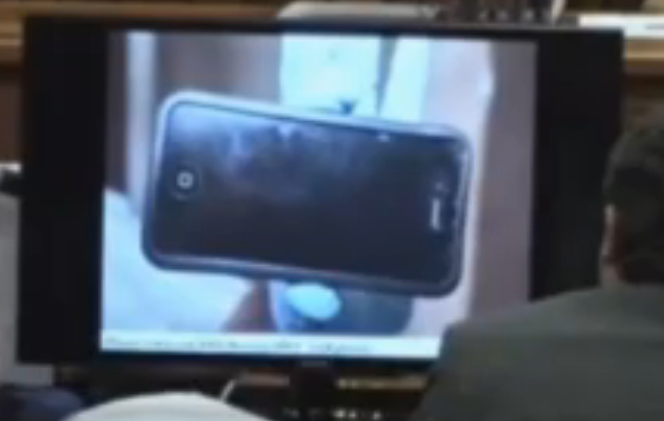 Nel shows him the photo and asks him if anything was tampered with. Oscar says he didn’t see his room with the lights on that morning so he wouldn’t know if anything was tampered with. But if he had to compare this photo with other photos taken, it shows the items being moved to different places. Nel then establishes with Oscar that if he looks at this picture there would be nothing striking out of place. Oscar goes in to a long explanation of how he and his legal team have poured over all the photos and the time stamps, etc and things had been moved. But he still can’t answer the question about how the scene was when he left it. 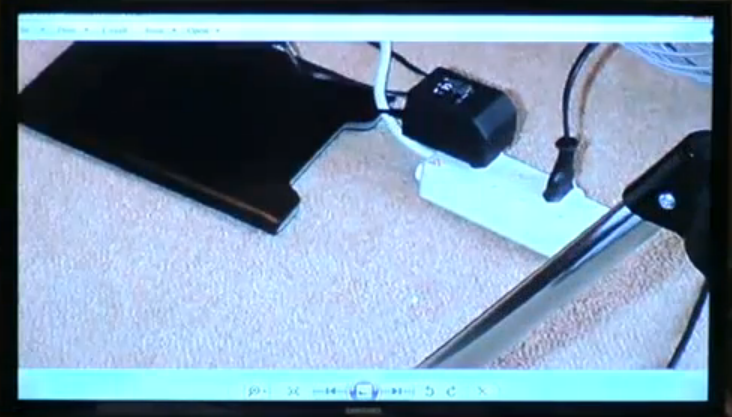 Nel zooms in on the floor now and points out the hair clipper next to the iPad. He wants to know if that is where Oscar left it. He is not sure if it was in the stand or not but he does plug it in to that extension cord (the white one) to charge, so he says it’s possible it was there. That extension cord is also where he plugged in the fans. Nel asks again if the clipper was plugged in to the extension cord. 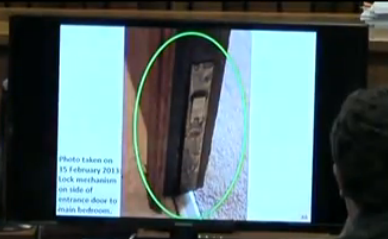 Oscar says it may have been or it may have been plugged directly in to the wall. Nel tells him he was right the first time, it was plugged in to the extension cord. You can see the large black plug is for the hair clipper and the other smaller two prong black plug is for the standing fan. Nel points out the problem here is that there’s no room on this strip to plug in the small fan that Oscar claimed was also on that night. That small fan requires a three prong socket and there are none left on that extension cord strip. So Oscar states that there’s another socket over by the TV cabinet where the smaller fan could have been plugged in. He goes on to say that he had three fans. Two floor fans and one standing fan. A friend of his came to visit him in January and he lent him one of the fans for his room downstairs. I’m not sure why he added that in to the story, perhaps just to ramble because he’s stuck in another jam. He’s not sure where the fans were plugged in. He says it’s possible he tripped over the cord on the way to open the balcony door, as an explanation for why it’s not plugged. He does not have recollection. Nel reminds him that just two minutes ago when they started this line of questioning, and before he saw the photo, he said he had plugged the fans in to that extension cord. Now he is stating that he doesn’t remember. Oscar says he doesn’t recall saying that but he’ll take Nel’s word for it. Nel pushes him on this and Oscar says to the Judge that his memory is not very good right now. He’s under pressure and it’s not easy sitting there defending for his life. He is doing his best to tell the truth and where the fans were plugged in is fairly insignificant. Nel says to him that no it’s not insignificant, it will show that he is lying. Next Nel says to Oscar that he stated in his plea statement that this incident was an accident. He wants to know, what was the accident? Oscar says he discharged his firearm in the belief that an intruder was coming out to attack him. So Nel asks him was the discharge accidental. And he says that it was accidental. He asks Oscar if he knows what an accidental discharge is. Oscar says Mr. Nel can explain it to him, but his understanding is that he didn’t mean to discharge his firearm. Oscar says he never intended to shoot anybody. He got a fright from a noise heard inside the toilet and he believed that somebody was coming out to attack him. He again says it was a desperate moment and he believed that somebody was coming out to attack me. That’s what made him fire his firearm. Out of fear, he didn’t have time to think before he discharged his firearm. So Nel summarizes, “because you feared, you shot at them?” Yes or no. Oscar says he didn’t shoot at them, he didn’t intend to shoot someone, he shot out of fear. Oscar can try to evade this question all he wants but the Judge is not stupid. Obviously if he says he was fearful that somebody was going coming out of that door to attack him, and he fired off his gun four times in to that door, he intended to shoot them. At the end of this trial, if the Judge does not feel there is sufficient evidence to prove that he intended to shoot Reeva, she certainly can determine that he intended to shoot “someone”. I don’t know how he can avoid culpable homicide at this point. But I am not a lawyer and these laws are complicated, so I can’t say for sure. But this is an important point that Nel is making and therefore Oscar has to answer extremely carefully. Nel continues, he needs him to answer. Is this accidental discharge or not. Oscar says the firearm was in his possession, his finger was on the trigger, it was an accident what happened. He didn’t intend to shoot anyone. He shot his firearm before he could even think, before he had a moment to comprehend what was happening. Nel then asks him, “was the only way out for you to shoot this intruder to protect yourself.” Yes or no. Oscar says he didn’t have time to think about if he was shooting an intruder or not shooting an intruder. Nel points out to him that in his testimony he was greatly detailed in his story about how he walked fast and when he walked slow… he explained every moment leading up to when the shooting happened. And Nel is absolutely right; Oscar made very conscious movements leading up to him entering that bathroom. Now all of a sudden, he says he didn’t have time to think about shooting his gun. But he had time to think about where it was, retrieving it, taking the holster off and how quickly or how slowly he was going to approach the bathroom, if he was going to scream or not scream. All of that was thought out, in Oscar’s version of events. But the one moment that counted, he all of a sudden can’t be responsible for thinking. Oscar does admit that he pulled the trigger. Right there, you cannot consider it accidental. Pulling the trigger is not an accident. He then goes on to say that he believed he was in danger, he had many thoughts about what could happen. So right there he admits he is having thoughts. If he can have thoughts about the danger, he can have thoughts about what he is going to do about it. The more he talks, the deeper he is digging himself. All the while, Reeva’s relatives are shaking their heads in the gallery. And as he continues to talk, he starts crying again. Nel wants to know why all of a sudden he’s crying. The Judge stops Nel and tells him not to ask that question. She points out that he has been emotional throughout. Nel says to the court that he won’t pursue that question, but he does say to Oscar that he’s not going to go away. He tells him that he (Oscar) is over-thinking every question and trying to figure out the implications of what he’s going to answer, isn’t that correct. Oscar says that his life is on the line, of course he is thinking about the implication of everything he is saying, it would be reckless not to do so. Nel points out that Reeva doesn’t have a life anymore because of what he’s done. So he needs to listen to the questions and give the truth and stop thinking about the implications for you. Nel concludes by reading the bail affidavit that clearly states, in Oscar’s words, “I felt trapped as my bedroom door was locked and I have limited mobility on my stumps. I fired shots at the toilet door and shouted to Reeva.” Oscar then says “I think it’s obvious that I shot at the door.” Now it’s obvious. He says he saw her phone on the floor of the toilet but I have a feeling that her phone may have been lying on the bathroom floor after a possible struggle, suggested by the cover having come off the phone, the dented metal plate and jeans on the ground outside. It would have been difficult for him to try to explain how her phone came to be on the bathroom floor although I’m not sure if this is relevant or not. I agree completely that her phone was not in the toilet room. The way it was found in the bathroom very much indicates to me that it was knocked out of her hand and I think it’s an important part of the argument sequence. Mrs. Stipp testified that the screaming seemed to be coming closer at one point, so much so that she thought somebody was in the street. This indicates to me that they were fighting elsewhere, probably in the bedroom. Then she ran in to the bathroom, probably with her phone to call for help. He caught up with her and she locked herself in the toilet room out of fear. The inside-out jeans in the bedroom and the duvet thrown on the ground also indicate some type of quick/possibly angry actions. The iPads seem to be thrown on the ground. One would think that with bedside tables that things such as phones and iPads would be placed on the table after use, not on the floor. Then add in the dented metal plate and damage on the bedroom door and that whole upstairs suite is very indicative of a fight. I see a planned murder. 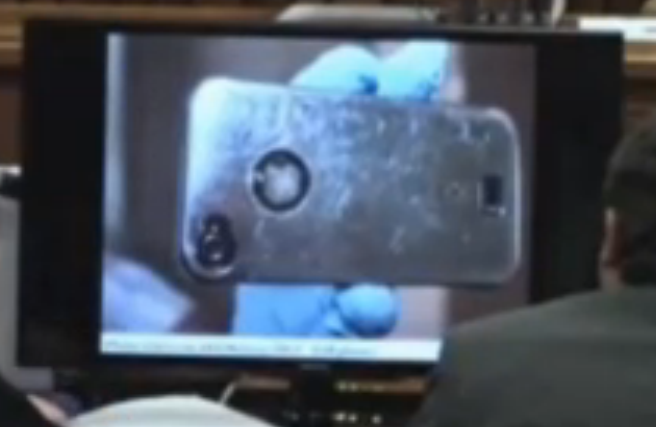 In regards to Reevas phone in cross examination it was Oscar that says he was the last one using it in bed. It is my view that at sometime when it suited he took posession of Reevas phone and stashed it away so she could not find it. If asked by Reeva she would be fobbed off with it being misplaced ..and not to worry, it will turn up. Eventually he places it in the bathroom after dropping it with the cover story of it being found on the toilet floor. Evidence shows it cannot have been where he said it was on the toilet floor. A few hours later when they are both downstairs Reeva locks the bedroom doors to escape Oscar and seeks to find her phone to call for help/police. She up ends the duvet in a desperate panic to find her phone that Oscar had already taken and retained. Obviously she cannot find it so she see’s Oscars white iphone…number ending 4949 on charge nearby and grabs that and heads off in terror to attempt to use his phone to call police/help…BUT FINDS IT LOCKED and its likely she may not have known she could make an emergency call with it , despite it being locked. It is my view she headed to the bathroom with this phone prior to Oscar breaking into the bedroom and that it was Reeva that placed the white phone under the bathrug to conceal it from Oscar in hope of not making him more annoyed..
A person with a gun has a lot of control…so if ordered to remove jeans and put on nightwear etc is demanded ..compliance is expected. hence he was worried that Reeva may have used it without his knowledge…and his claimed forgetting of his password for that 4949 phone. Thanks for sharing your views. Respectfully, I have some different views on this. I am convinced that Oscar intentionally put his iPhone ending in 4949 in the bathroom some time that morning for the investigators to find. The last call on the 4949 phone was at 5:15pm that night. 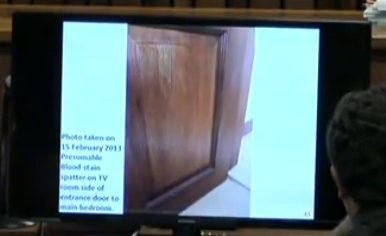 He had been using the 0020 for the remainder of the night, including for calls with Reeva. The calls to Stander, Netcare, Baba, Justin, etc were all made on the 0020 phone that night as well. So there was no reason for the 4949 phone to be in the bathroom at all. Remember, Samantha Taylor testified that he used to plug one phone in to the charger downstairs at night and the other phone was by his bed at night. I have a few different theories on the logistics of how he did this… but ultimately, he swapped out the phones so he could remove the 0020 phone from the scene. One other thing… he did not forget his password for the 4949 phone. It was the password to his Whatsapp application (for text messaging) that he could not remember. Juror 13 – you are brilliant. Mr nel could have a good assistant. A few things; would Oscar’s shorts have been too long without his legs on? – did Oscar have a meeting that didn’t go well on 13th Feb – causing him to be in a bad mood (from texts). 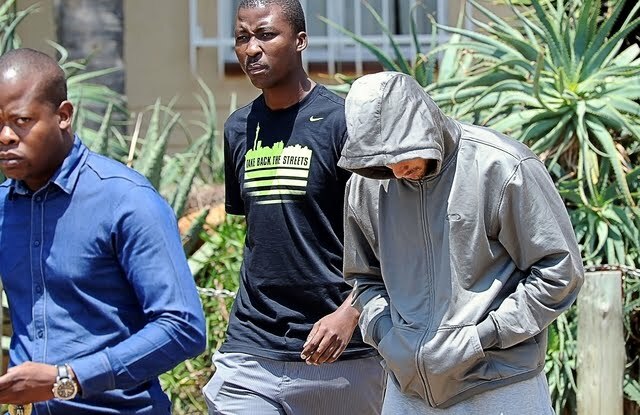 Finally – the black sacks – the rope and tape – the call to the ‘friend’ Mr stander indicate to me that reeva was to be disposed of and the whole bloody mess dealt with by Oscar’s ‘people’ – but the arrival of Dr.stipp made a new plan necessary. Thanks, Pamela. I don’t think his shorts would have been too long as his stumps extend below his knees. But I do theorize in one of my posts about Oscar that his legs were on the whole time and he did the shooting from a lower down position (crouching). Oscar testified on stand that his meeting on Feb 13 was a financial meeting, and we know that Reeva had texted him to console him about some “hurdle” that he was facing. She also suggested that he may want to spend the evening with his siblings (for comfort presumably). Too bad he didn’t! As with all things Oscar, I definitely do not think that we got the real story about what was going on February 13th. That whole day felt so “off” to me in testimony. As for the bags, etc… I’m not of the belief that anybody was trying to dispose of a body. That is too far-fetched for me. I have no reason to believe that the Standers would ever be involved in something that horrible. But what I do think is that Oscar wanted the Standers to take Reeva to the hospital so he could get her out of the house. He was desperate to get her out of there – pleading with Carice to take her. He most definitely did not want security there. He needed time. That’s not my opinion, that’s clear evidence presented at trial. The Standers never would have needed to know about any clean up or cover up… all they would know is that they are taking a gravely injured person to get help. Oscar could have cleaned up a whole heck of a lot of in the time they were gone, hence the plastic bags. As much as I’d like to be fair to the Standers, I can’t completely give them a pass as just being biased friends. 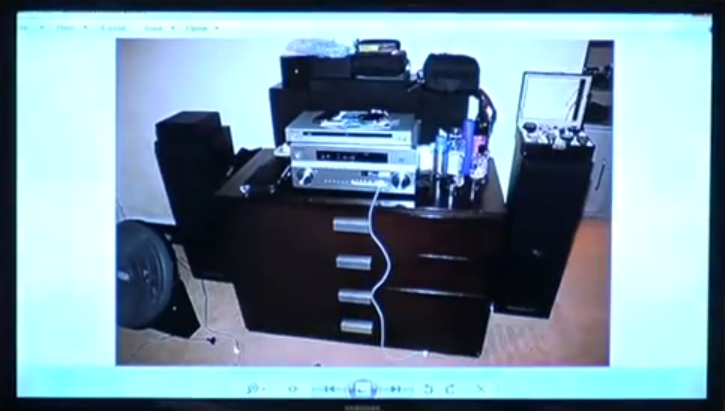 Carice did say on the stand that she asked for the bags and tape to tie off Reeva’s arm wound. I don’t want to assume that Carice is outwardly lying, she may not be, but using a plastic bag to tie off a wound is so nonsensical to me. And then… let’s not forget… Carice was complicit in allowing Aimee to take Reeva’s handbag from the scene. You’ll read about this stuff in my most recent posts. That is flat out illegal and she is a lawyer so she should know better! There is a lot, which could indicate a struggle, a fight – the inside-out jeans, the jeans outside the bathroom – I really wonder why this was not brought up as an evidence for a possible fight? There are small injuries mentioned on the (left?) hip, inside left knee and shin which are not related to the shots – I assume she wanted to leave and he hindered her, pulling her jeans off. You are so right – there are so many off-key details he mentions – sounding suspiciously even more. Like him ‘not going through Reevas handbag’ – which he fetched allegedly ‘from the bedroom’ despite Clarice (or Carice?) 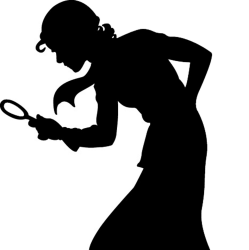 testified, she heard ‘him walking on the tiles/in the tiled area’ whilst ‘fetching the handbag’ – which then conveniently disappeared with Aimee. It’s really such a tragedy, Reeva Steemcamp was a beauty and as it seems, this out- and inside and the clips from this tv-show reflect that pretty much. I cannot understand why OP isn’t expressing much more sincere regret and remorse, since he’s ‘so emotional’ and if he is ‘innocent’. But- sure – if he did it conscious – in rage – knowing her behind the door – than he can’t say stuff like that. Too much acting there, I presume. Thanks for reading, Alfred! Glad you like it 🙂 You make a really good point about how he does not come across as being upset with himself for making such a horrendous error (according to him)… instead his emotions seem totally misguided. His vomiting is elicited by submit matter like autopsy photos or conversations about Reeva’s injuries. It’s not a sad, grieving type of weeping… it’s more like he’s grossed out. I understand that everybody has a right to a defense, but he comes across as completely bamboozled by the charges that are against him. He can’t even admit that the situation looks suspicious. He can’t fathom why people would think he did something wrong. I would imagine that anybody who genuinely killed a loved one by mistake, would hate themselves. They would make all of the comments that you mentioned – I was so stupid, how could I have done that, I’ll never forgive myself, etc. OP doesn’t say any of those things… he tries to justify everything as if we are a bunch of morons who just don’t get it. In regards to what I said about the possibility of the duvet being upended by a frantic Reeva looking for her phone. The tv remote and ipad and its cover being on the bedroom floor on the right side are consistent with the being on the duvet if it was upended in a search for her phone. As for the remote and the ipad and its cover, they do not fit with being normally kept on the floor as it would be awkward and be prone to damage and causing accidents. If you take a look at the right side bedside table there is a free space on its top that is ideal for placing the ipad and remote which suggests that in normal circumstances they would have been put on that bedside table. That it appears they had been left on the duvet at some time prior to it being upended does suggest some unsettling things going that meant items were casually left on the duvet when a person or persons using them headed off out of the bedroom. Is it just me, or does anyone else find the original position of the fans (tripod fan: one leg out on the balcony, other two legs inside the door) and the tripod fan wedged between the doors, really weird? Who does this, and why? I wonder why Oscar was never asked about this? Also, as someone who uses a fan at night, I always prefer the fan to be on my side of the bed (my partner doesn’t find it as stuffy at night) and so I find it strange that, on Oscar’s version, when he went to bed, the fans were not blowing in his direction, especially as it was a humid night and the AC was not working. For his version, Oscar wants to keep his back to the bed when it is light enough for him to see Reeva. The further out the fans are on the balcony, the more likely he is to turn around rather than walk backwards on his stumps. 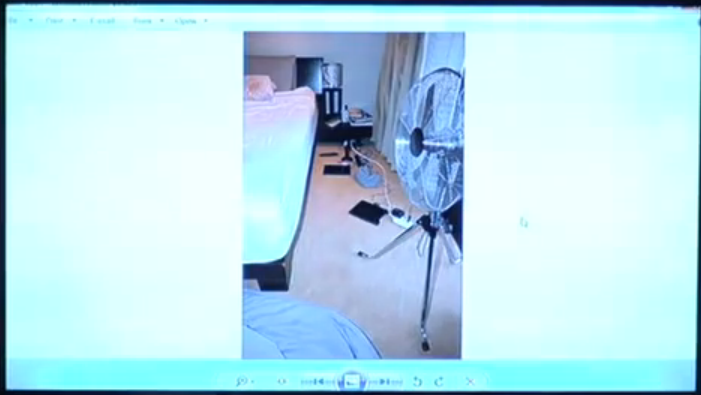 He cannot turn around on his version because he would then be directly facing the bed with enough light to see that Reeva was not in bed. So, I think he may have realised this and for this reason, said that he only had to bend down and grab the fans so that (i) he didn’t have to turn around and face the bed with enough light to see Reeva or (ii) improbably walk backwards on his stumps.